Welcome to Haden Heritage, the site for the industrial history of the Haden family. Two industries were important for the Haden family during the nineteenth and twentieth centuries in the West Midlands of England: glassmaking and bicycle/motorcycle manufacture. Our roots are the heart of the Industrial Revolution, in the Stourbridge glassmaking district of the Black Country and in the nearby city of Birmingham. James Speed, c.1883. Photo retained by Magoichi Shimada, one of his trainees in Japan. JAMES SPEED (1834-1908), our great grandfather, was a Scottish glass artisan. 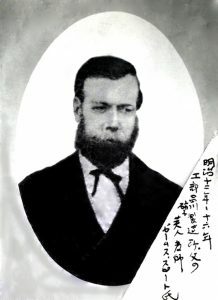 Around 1873 he moved with his family to the Stourbridge district in the Black Country and soon after was invited by the Japanese government to be the head glass craftsman at Japan’s first Western-style industrial glassworks in Tokyo, 1879-1883. This factory is recognized today by Japanese glass manufacturers as the seed of their modern glass industry. After his return he lived with his family in Birmingham where he was a glassworks manager, sometimes also working in Edinburgh. In 1903 his daughter Agnes Speed married Alfred Haden, our grandfather. 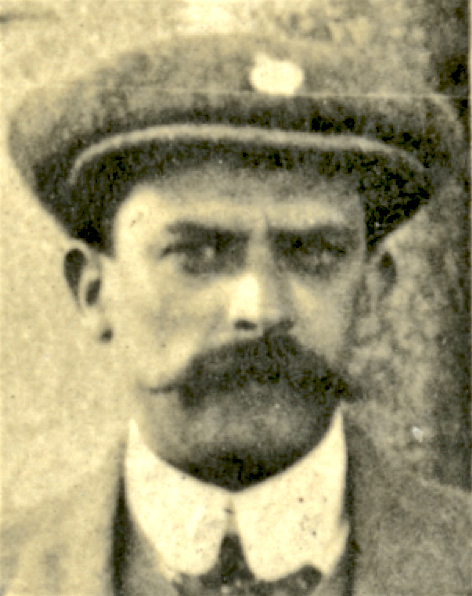 ALFRED HADEN (1875-1940) was a pioneering cycle and motorcycle manufacturer, the son of George Haden, a glass cutter from Stourbridge. George had moved to Birmingham in the 1870s in order to set himself up as a cycle maker. By the early 1900s Alfred was established in Princip Street in the city. There he applied his design skills to the development of a Haden motorcycle marque. This became the “New Comet” motorcycle, which had great success in the 1920s. Alfred’s twin sons Denis and Donald took over the reins of the business around the time of WWII, returning manufacture fully to what had always been its mainstay, cycle components. Latterly, until its final closure in 2002, Haden Bros Ltd. made a wide variety of parts for the bicycle and motor vehicle industry. Pages about the 20th century history of the company will be added soon. For now, see here for some photographs of the New Comet.